The Arachnipod is an innovative multipod design that captures multi-functional capabilities from a modular rescue system platform. Simplicity and robust engineering provide the world’s most versatile modular total edge management system (TEMS) Ferno-Australia is dedicated to design and innovation and as such recognised the need for one height safety edge management device that could easily adjust into multiple configurations, providing users with a safe, cost effective total edge management system. The new innovative Arachnipod is based around the concept of an industrial tripod however this product is much more than just a tripod. 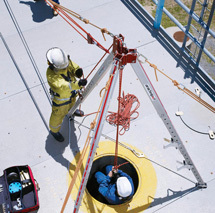 The Arachnipod is the easiet-to-use rescue multipod available. In its basic form, the Arachnipod is a tripod or quadpod. 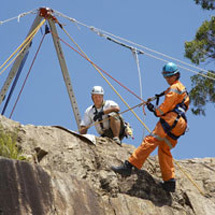 But, it can evolve, for rope rescue technicians, into an advanced edge management system that includes BiPods, A-Frames, Monopod, Gin Pole, and bridge system. Built in Australia by Ferno-Australia and exclusively distributed in the U.S. by RescueTECH.